Users of the peer-to-peer prediction market and derivatives platform Veil can now create their own prediction markets and collect bets, and they are already using this feature. 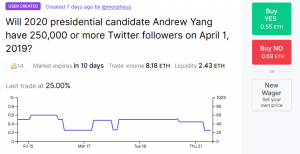 New markets include whether presidential candidate Joe Biden, former US vice president, will be polling first in the 2020 Democratic Presidential race by June 12th, or if the Avengers: Endgame movie will gross more than USD 275 million on its opening weekend in the US, and others. “For markets with clear resolution, Veil may offer Instant Settlement to users. This means that users will be able to redeem their positions based [on] your initial report before the Augur market has been finalized. Veil will offer Instant Settlement on a case-by-case basis and only in situations where it is very likely Augur will resolve the market consistent with your report,” the blog post explains. Users are already on it. A question of “Will Barcelona qualify for the Champions League semi-finals?” expires in 26 days, after the rematch between Barcelona and Manchester United. Currently, buying a “yes” answer costs ETH 0.8, while a “no” costs ETH 0.5. The market is at 80% for “yes,” which may not necessarily be in line with what experts predict, but shows what the market currently thinks. 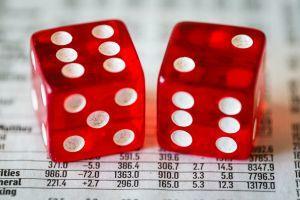 However, the more people believe a certain outcome, the more expensive buying that option becomes. Moreover, Veil charges a 1% fee per trade as well as a 1% settlement fee if you elect to use the Instant Settlement feature. Another market is “Will FAA [Federal Aviation Administration] revert Boeing 737 Max 8 grounding decision before 30th March 2019?” The entire fleet of Boeing 737 Max 8 has been grounded following two crashes, the more recent one being in Ethiopia. The market is mostly voting “no” and the chance for that currently stands at around 5% for yes. This is why buying a “no” option costs ETH 0.95, while a yes is a mere ETH 0.1999. As of the time of writing, Veil has 58 active user created markets, although the majority of those are drafts: ones that haven’t been persisted to Augur yet or been activated. The number of active markets is 14, and many of them center around football and the UEFA Champions League or US politics. Meanwhile, Augur is looking for ways to solve the problem of fraudsters cheating the system. 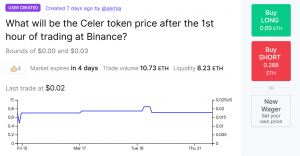 Allegedly, they’re creating invalid markets which get users to distribute their profits to attackers - and the problem can be fixed only with a huge update, which is set to come later this year, according to Augur co-founder Joey Krug. The scam works with attackers making markets expire before their real expiration time, which flags the market as “invalid” - and the system is designed to distribute all funds held in the market equally between participants. This means that even though the attackers bet on impossible outcomes, they still profit, even though they shouldn’t.